This exhibit celebrates the extensive contribution by world-renowned musicologist, Hugh Tracey, to the knowledge and preservation of traditional African music. 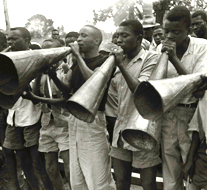 The exhibition was co-ordinated by the International Library of African Music (ILAM) based at Rhodes University and includes Hugh Tracey’s original field recordings along with examples of traditional African instruments. The exhibition is accompanied by DVDs and a catalogue.